Titan exhibits abundant complex organic compounds on the surface of a water-ice-dominated ocean world with Earth-like geologic and atmospheric exchange processes. In addition to the level of organic synthesis that Titan supports, there have also been opportunities in Titan’s past for organics to have mixed with liquid water on Titan’s surface, for example at sites of cryovolcanic activity or impact melting. Such interactions increase the potential for chemistry to have progressed beyond simple organic reactions, providing an unparalleled opportunity to study prebiotic chemistry, and to search for signatures of potential water-based and hydrocarbon-based life. Thus, Titan is an ideal destination to seek answers to fundamental questions about the origins of life, such as: What makes a planet or moon habitable? What chemical processes led to the development of life? While the now completed Cassini mission discovered that the chemical reactions in Titan’s upper atmosphere generate much more complex organic molecules than had been expected, the compositions of the solid materials on Titan’s surface remain essentially unknown, and the spacecraft revealed substantial compositional diversity across Titan’s surface. Therefore it will be key for a future mission to be able to measure surface material compositions at a variety of locations: mobility will be essential. This lecture will discuss the Dragonfly mission concept under study in NASA’s New Frontiers Program. Dragonfly is a rotorcraft lander that would take advantage of Titan’s dense atmosphere and low gravity to use aerial mobility for wide-ranging in situexploration of Titan’s surface and atmosphere. Dragonfly’s ability to fly will enable it to access different geologic settings 10s to 100s of kilometers apart, allowing Dragonfly to perform multidisciplinary science at multiple, diverse landing sites. In its two year plus mission, Dragonfly’s revolutionary mobility will allow it to characterize prebiotic chemistry and habitability at dozens of diverse sites across Titan and to search for water- and hydrocarbon-based chemical biosignatures at each one. 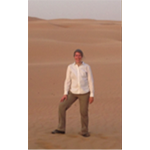 Elizabeth (Zibi) Turtle is a planetary scientist at the Johns Hopkins Applied Physics Laboratory. She is the Principal Investigator of the Europa Imaging System (EIS) on Europa Clipper and Principal Investigator of the Dragonfly mission concept currently in competition under NASA’s New Frontiers Program. Zibi also is an associate of the Cassini ISS and RADAR teams, a Co-Investigator of LROC on the Lunar Reconnaissance Orbiter. Previously she was an associate of the Galileo SSI team. Zibi’s research combines remote-sensing observations and numerical modeling, focusing in particular on impact cratering and tectonics on satellites and terrestrial planets, and on lakes and weather on Titan. Zibi earned a BS in Physics at MIT and a PhD in Planetary Sciences at the University of Arizona. On October 5, 2018, President Larry Millstein called the 2,397th meeting of the Society to order at 8:00 p.m. in the John Wesley Powell Auditorium of the Cosmos Club in Washington, D.C. He announced the order of business, that the evening’s lecture would be livestreamed on the internet, and welcomed new members to the Society. The minutes of the previous meeting were then read and approved. The largest of Saturn’s 62 moons, Titan has an opaque orange, methane-rich atmosphere that obscures its surface. Because methane breaks down and escapes, there must be a source on the moon to replenish it. Scientists hypothesized the existence of a global ocean of methane on Titan’s surface. In 1995, the Hubble Space Telescope first saw through Titan’s atmosphere and revealed the existence of surface features. Subsequent telescope observation confirmed that Titan’s surface is not uniformly smooth. Turtle said Titan’s bedrock composition is water ice, covering a deep liquid water ocean that has may interact with organic elements on the moon’s surface. In 1997, NASA and the European Space Agency launched the Cassini-Huygens mission to Saturn, which arrived in July 2004. Six months later, the Huygens probe descended through Titan’s atmosphere and landed on its surface. Over the next 13 years, the Cassini Orbiter made 126 close Titan flybys. Cassini-Huygens revealed the details of Titan’s surface, for example it has surface temperature of 94 Kelvin, a water-ice surface, and surface dunes comprised of organic compounds. In sum, Turtle said Titan has the key ingredients known to be necessary for life: energy in the form of sunlight, abundant carbon and complex organics, and solvents – specifically liquid water and methane. Turtle said that scientists now know Titan is sufficiently Earth-like to be useful in answering fundamental questions such as what makes a planet or moon habitable? And, what chemical processes led to the development of life? From Cassini’s observations, scientists believe they know specifically where to look on Titan for answers to these questions. The challenge is to get a capable instrument suite to multiple high-priority sites on Titan to sample materials and to measure compositions. Mobility, Turtle said, is key. Because Titan’s atmosphere is 4-times denser than Earth’s and its gravity is 1/7th of that on Earth, Turtle said that flight would be an efficient means of surface transportation. 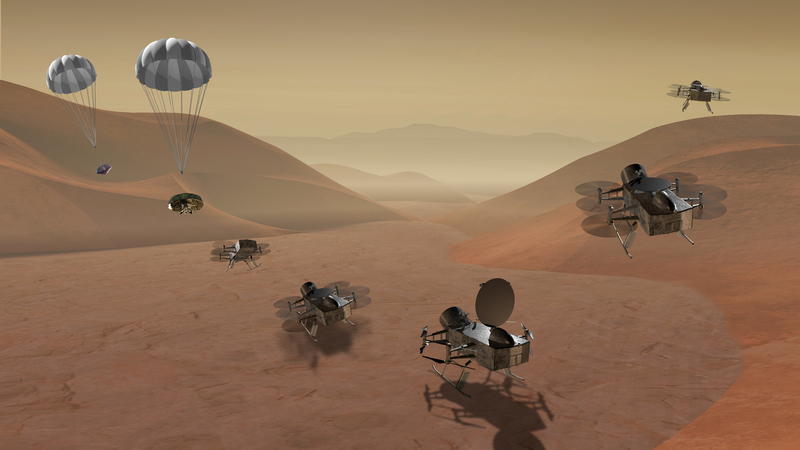 Turtle’s team therefore proposes to explore Titan with Dragonfly, a dual quadcopter designed to land, make measurements, and fly to scout and to travel to new locations. Dragonfly would be battery powered, recharged by an MMRTG between flights, the same power source used by the Mars Science Laboratory. Dragonfly’s science objectives are to analyze the chemical components and processes that produce biologically relevant compounds, take atmospheric measurements, and search for chemical evidence of water-based or hydrocarbon-based life. To do so, Dragonfly will carry a mass spectrometer, a gamma-ray and neutron spectrometer, meteorology, seismic and geophysical sensors, and a camera suite. Turtle then described those instruments and the specific experiments they will carry out. If accepted, Dragonfly plant to launch in 2025, arrive at Titan in 2034, and land in Titan’s equatorial interdunes to conduct two years of surface exploration. NASA is still reviewing the Dragonfly proposal and is currently scheduled to make a decision on it in Summer 2019. After the question and answer period, President Millstein thanked the speaker, made the usual housekeeping announcements, and invited guests to join the Society. At 9:40 p.m., President Millstein adjourned the 2,397th meeting of the Society to the social hour.